I can’t tell you how much I loved this book. I finished it a few days ago and haven’t been able to get all my thoughts together because there were so many I didn’t know where to begin. This review is going to be a bit different (and longer) than my usual reviews, just because when I really enjoy a book, I love to share its awesomeness with everyone, and I have a lot to say about it. 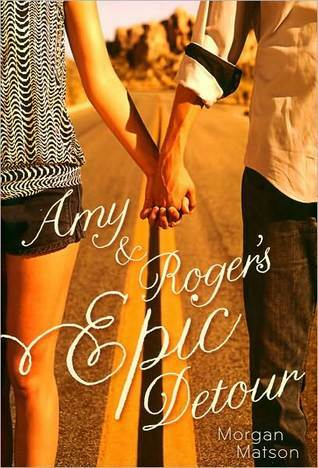 I’ve always dreamed of going on an epic road trip like the one Amy and Roger took. I love road trips, but rarely get to take them anymore, so this book was the perfect way for me to live vicariously, and I enjoyed every second of this adventure. 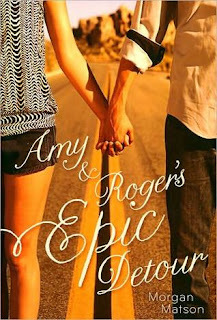 I love Amy and Roger, separately and together. Amy was so relatable to me; she’d been through a trauma, and her emotions were so real – the pain, the avoidance, the anger, the awkwardness around other people, all of it. It was so great to watch her blossom and find herself again, and learn new things about herself. Roger is just plain amazing. He’s sweet without being one of those guy characters who’s so perfect he’s unbelievable. I also enjoyed watching his transformation - although subtler than Amy’s, it was still interesting to see. I thought these two were great together – the way they quickly learned each other’s moods, habits, expressions and body language was so real and it was a lot of fun to see them discovering things about each other without really realizing it. I also loved all the quirky characters the pair met along the way. Well-written, laugh-out-loud funny, achingly real and believable. We know that Amy’s father died, and we know how, but it takes a long time for us to learn the details, and I was so curious. I was sitting in the library when I read the part where Amy finally tells Roger what happened, and I had to stop reading because I was crying. Seriously. Her self-blame and guilt were so real, it broke my heart. *Amy’s dad’s death really hit me hard, because my dad died a long time ago and we had a really special bond, like Amy had with her dad. Whether it was an accident or something else, and even when there’s absolutely nothing anyone could have done, when a kid loses a parent, there’s going to be guilt there, and possibly even self-blame. I could really relate to what Amy was going through, even though my dad died of a prolonged illness, not a car accident, and I was much younger than she was when it happened. *I said at the beginning that I’ve always dreamed of going on an epic road trip…well, I’d be lying if I said I’ve never had an epic road trip of my own, even if it was a lot different. I’ve had a few really terrific road trips, but only one American one. A few years ago, I met a girl online and we became fast friends. We talked all day every day, had tons in common, and it felt like we’d known each other our entire lives. Just a few months after meeting online, we decided it was time to meet in person…only, she lived in Kentucky and I live in Ontario, Canada. So, she drove from Kentucky to here (13 hours), stayed with us a couple days, then the two of us headed back to KY. After a couple days there, we headed out with her mother and nephew to Virginia to visit family. So that’s a 13 hour straight trip, followed by a 9-10 hour trip. While we were there, we visited DC and Maryland. On the way home, we split from her mother and nephew – they went home, and we came back here, but took a different route (another 9-10 hour drive). So I saw 9 states in as many days: Michigan, Ohio, Kentucky, West Virginia, Virginia, DC, Maryland, Pennsylvania and New York (the only state I’d been to previously). Amy and Roger hit 14 states, so we weren’t far behind. That girl and I are no longer friends, but this book made my heart ache a little with the memories of our own epic adventure, especially when Amy and Roger were in Kentucky and Virginia. Our playlist consisted of non-stop U2 (we met in a U2 fan forum), and we had some amazing food along the way, just like Amy and Roger. We also met some pretty memorable characters. And like Amy, I learned quite a bit about myself on that trip. This is one of those books that it seems like everyone has read, but if you haven’t, you really should. I know I’ve rambled on endlessly, but there’s so much more I could say, I just really and truly loved this book. I love this book so very much as well! It's seriously amazing, and the characters are fantastically written, but I really had to say that I absolutely agree with you on empathizing so much with Amy on experiencing the loss of a dad like that. I don't read a lot of books where a dad dies/has died because it's just so hard to take, but this one really spoke to me. It's seriously beautiful!